What Did the Pilgrims Wear? Rebecca Beatrice Brooks July 22, 2018 July 25, 2018 No Comments on What Did the Pilgrims Wear? The Mayflower pilgrims are some of the most iconic figures in American history. One glimpse of their black clothes and buckled hats and you automatically know who they are. You’ll be surprised to know though that this image of the pilgrims is not entirely accurate. Although it isn’t that far off, this is not exactly what the pilgrims wore. These famous images of the pilgrims came about in 19th century depictions of them and may have been based on a portrait of Edward Winslow from 1651 in which he is wearing black. These images of pilgrims wearing all black with buckles on everything are not historically accurate though and were mostly invented by Victorians who tended to romanticize and embellish the past to fit their own ideals. For under garments, women wore a shift, which was a long, loose shirt with long sleeves that reached down to their ankles. Over the shift, women wore stays, which is what we would call a corset. These stays were stiff, sleeveless garments designed to provide shape and support. The stays were stiffened using rows of stitching or reeds or sometimes had a flat piece of wood, called a busk, inside the center front of the stay. Women also either wore a linen kerchief that draped around their neck and tucked into the top front of their stays for modesty or they wore a flat linen collar. Over the stays, women wore a waistcoat, which was like a long-sleeved, close-fitting jacket, that was made out of linen canvas or wool. Women also wore one or two petticoats, which were long, full skirts made out of linen or wool. On their legs, women wore stockings, which came up over the knee and were tied with garters, that were made from ribbon, knitted or leather strips, to keep them up. These stockings were hand-knitted and were usually made out of wool or linen. Women also wore aprons over their clothing to keep them clean and leather shoes. Women wore their hair pinned up under a linen cap, called a coif, and often wore a felt hat over their coif. For under garments, men wore a loose, long-sleeved knee-length linen shirt. Over this shirt they wore a doublet, which was a long-sleeved jacket with a single row of buttons down the front. The doublet was attached to a pair of breeches, which were knee-length trousers, to make a suit. These suits were usually made out of wool or linen canvas. In addition to these breeches, men also wore wool stockings that came up over their knees and were tied with garters to keep them up. On their feet, men wore leather shoes or boots. On their heads, men often wore a hat called a Capotain, which was a tall, crowned, narrow-brimmed hat. 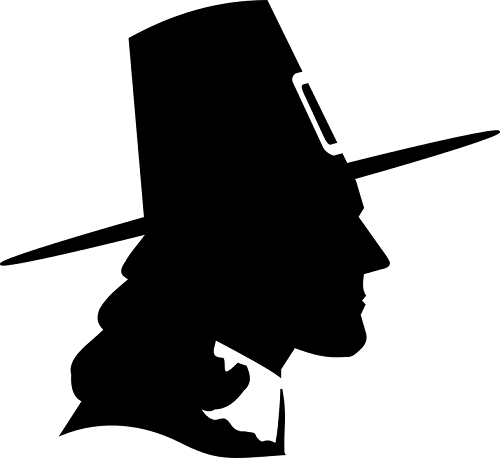 These types of hats are also called a Flat Topped Hat or a Pilgrim Hat because of its association with the pilgrims. Contrary to public opinion, these hats did not have buckles on them. Men and boys also wore caps made from knitted wool or wide-brimmed felt hats. Around their necks, men wore either a ruffled collar or a flat collar made of linen. For outerwear, men often wore coats or cloaks of various lengths that were made from wool. Baby boys and girls were dressed the same way. They wore gowns (a one piece dress) with long sleeves. According to an article about pilgrim’s clothing on the Plimoth Plantation website, when toddlers were learning to walk, long strips of fabric called “leading strings” wore sewn into the shoulders of their gowns. A parent or older child held the strings to help the child keep their balance as they walked. Babies sometimes wore something called a pudding, which was a padded roll, around their foreheads to protect their heads. Babies also wore biggins on their heads, which was made of linen or wool and was tied under the chin, to keep their heads warm and wore aprons to keep their gowns clean. Around age six or seven years old, they began to wear grown up clothing. Did the Pilgrims Only Wear Black Clothes? This fact is supported by the pilgrim’s various wills and personal inventories that list the items of clothing the pilgrims owned and mention the colors of these items. 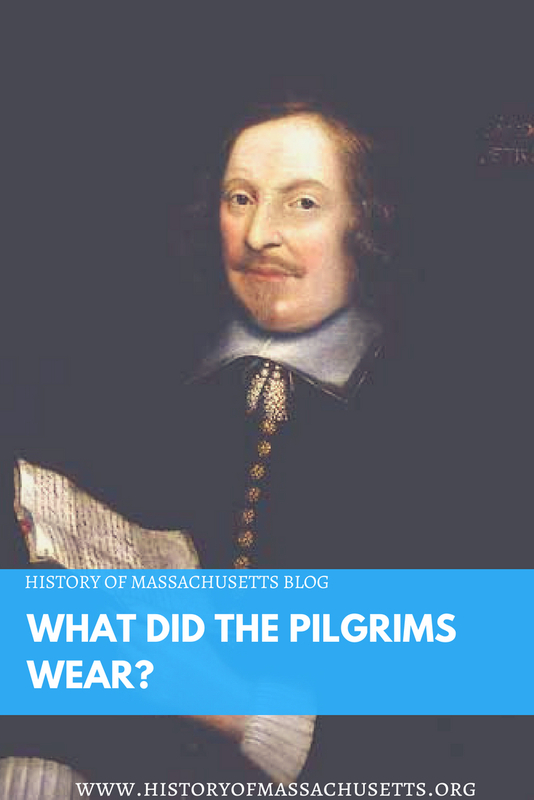 What Were the Pilgrim’s Clothes Made of? The pilgrim’s clothes were made from linen, wool and leather. Linen is a natural fiber spun from the flax plant. Wool is woven from sheep’s wool. Leather is made from the hides of domesticated animals. 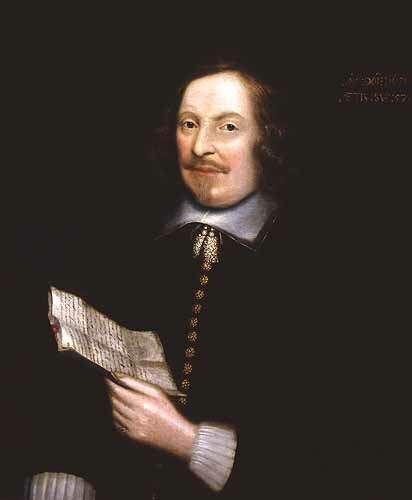 This 1651 painting of Edward Winslow, by an unknown English painter, is the only authentic portrait that a Mayflower passenger actually sat for during their lifetime and is therefore the only likeness of a Pilgrim made from life. In the painting, Winslow is wearing a black doublet with gold-colored buttons down the front and a white linen collar and white cuffs. His hair is mid-length and he is not wearing a hat. According to an article on the Pilgrim Hall Museum website, the portrait was painted during Winslow’s trip to London in 1651 at a time when the color black was very fashionable. When the pilgrims traveled to the New World in 1620, colors were fashionable so they wouldn’t have been wearing black at that time. In this 1843 painting, titled Embarkation of the Pilgrims, by Robert W. Weir, some of the pilgrims are depicted as wearing all black while the other pilgrims are wearing more colorful clothing. The three kneeling men in the middle, William Brewster, Governor John Carver and Pastor Robinson, are depicted as wearing doublets and breeches in neutral shades of dark brown and black. Robinson is also wearing a long black robe, signifying his role as the group’s religious leader. Brewster and Robinson are both wearing flat linen collars while Carver is wearing a ruffled collar. To their right, Miles Standish, the colony’s military adviser [who, as a non-separatist, was not a pilgrim], is depicted wearing brown shoes, reddish-brown stockings and breeches with a gold or yellow stripe down the seam, a gold or yellow shirt and an armored vest, while a helmet lies on the floor by his bended knee. The kneeling couple on the left side of the painting, William and Susannah White, are also depicted as wearing colorful clothing. Susannah is wearing a yellow and blue/gray striped dress with a red cloak while William is wearing a tan or light-brown doublet and a ruffled collar. 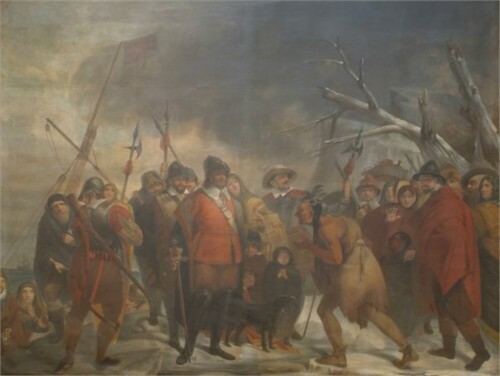 The woman standing on the left hand side of the painting, Elizabeth Winslow, is depicted as wearing a reddish-brown waistcoat, a gray coat or cloak, a standing collar and a wide-brimmed hat adorned with a feather. The remaining men in the painting are depicted as wearing black or brown doublets and breeches. 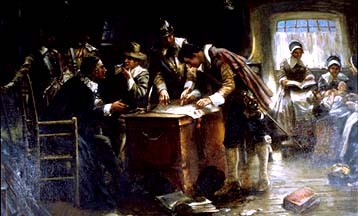 In this 1900 painting, titled The Signing of the Compact in the Cabin of the Mayflower, by Edward Percy Moran, the pilgrims are also depicted as wearing a mix of black clothing and colorful clothing. The figure standing at the desk with the pen in his hand is William Bradford and he is depicted wearing light brown shoes, white stockings, blue or black breeches, a light-colored doublet, a reddish-brown cloak and a white linen collar. Next to him stands Miles Standish, wearing an armored vest and helmet, while William Brewster, seated at the desk with John Carver, is wearing a black robe, due to his new role as the group’s religious leader in the absence of Pastor Robinson, and Carver is wearing a brown doublet and a wide-brimmed hat. A man in the background also wears an armored vest and helmet while another one wears a light-brown doublet and a wide-brimmed hat. The women in the right-hand corner of the painting are wearing brown and black petticoats and waistcoats, white aprons, linen collars or kerchiefs and white linen caps. This 1818 painting, titled Landing of the Pilgrims, by Henry Sargent depicts the Mayflower pilgrims wearing a mix of light and dark clothing. The man in the center of the painting is depicted wearing black boots, brown breeches, a red doublet, a gray coat and either a helmet or a hat. Several other pilgrims are depicted wearing red or yellow cloaks or coats while the men in the background are wearing more muted colors such as grays and browns. 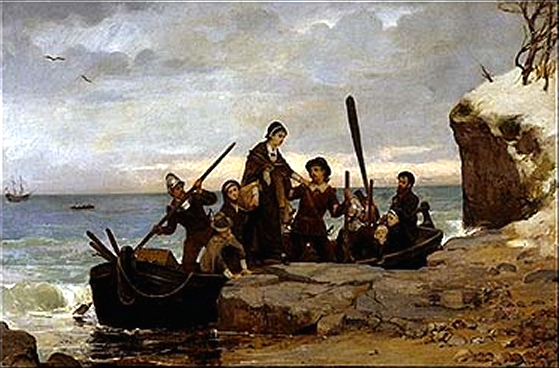 The painting depicts Mary Chilton stepping ashore on Plymouth rock. The pilgrims are not depicted wearing black but they are wearing muted neutral colors like browns and grays. One of the men is wearing doublet with a gorget and a helmet while the other man is wearing brown breeches, a brown doublet, a linen collar and a wide-brimmed hat. Mary Chilton is depicted wearing a dark-colored petticoat, a brown shawl or cloak and a linen cap. It is hard to see what the other figures are wearing but they also appear to be wearing caps, shawls or wide-brimmed hats. 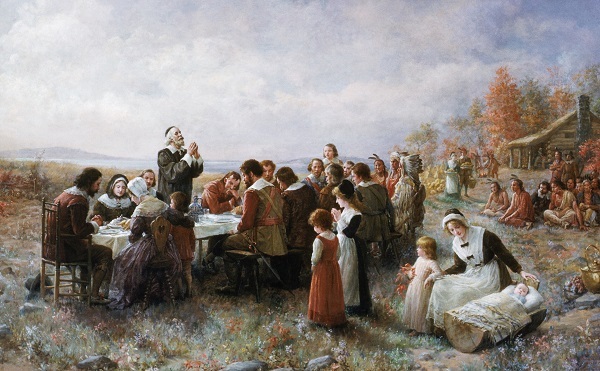 This 1914 painting, titled The First Thanksgiving at Plymouth, by Jennie A. Brownscombe depicts the pilgrims at the First Thanksgiving. 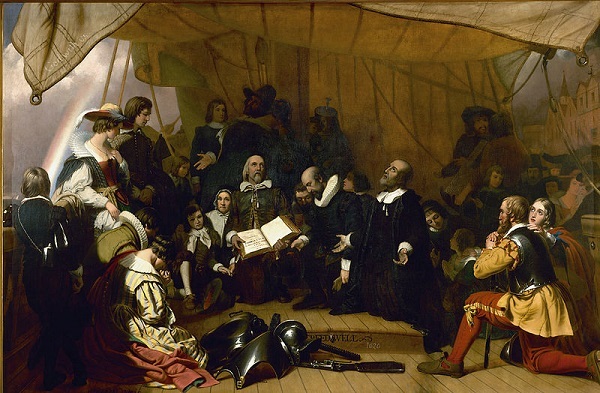 The pilgrims are not depicted wearing black in this painting either but they are wearing neutral colors like brown. In the painting, the men seated around the table are wearing doublets and breeches in brown, green and yellow hues. William Brewster, the pilgrim’s religious leader, is standing at the table praying while wearing a black robe with a white linen collar. The women and girls in the painting are wearing dresses in reddish-brown/pink, purple, brown and green with white aprons and linen caps. If you are researching the Mayflower pilgrim’s clothing for a class project, presentation or Halloween party, check out the following article about the best pilgrim costumes. Shepard, James. Governor William Bradford: And His Son, Major William Bradford. James Shepard, 1900.